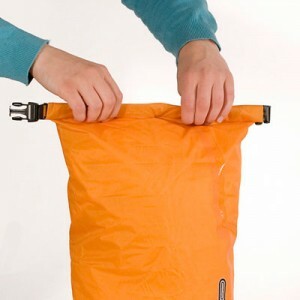 The characteristic of numerous ORTLIEB panniers and drybags is the waterproof and dustproof roll closure. 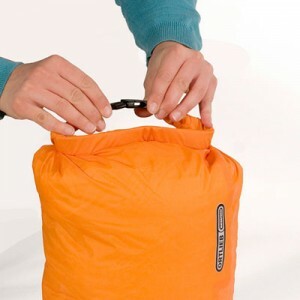 The top end of the pannier or drybag is tightened by means of pulling on the two plastic buckles; then it is rolled at least three times before housing and buckle are closed. The upper thin plastic stiffener bars (one or two) sewn into the top edge of the product provide the waterproofness and stability of this closure type. In case the product is submerged, the closure must be rolled 3 to 4 times in order to guarantee waterproofness. 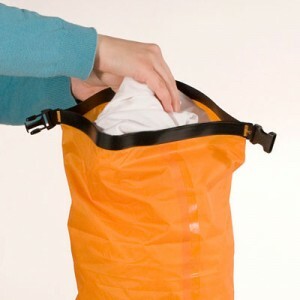 The height and volume of drybags and pannniers can be reduced by rolling the bag down as far as possible. This will result in a more compact product. The strap of the roll’n snap closure serves as carrying handle. Some products are also provided with so-called D-rings mounted to the buckles. They serve as additional fixing points for mounting or for carrying straps.